With exams for the majority of students here at the University of Aberdeen due to begin at the end of this month we thought it would be timely to remind you of the range of different types of study spaces available to you in The Sir Duncan Rice Library, as everyone likes to study in different ways and this library certainly offers spaces to accommodate all types of revision. 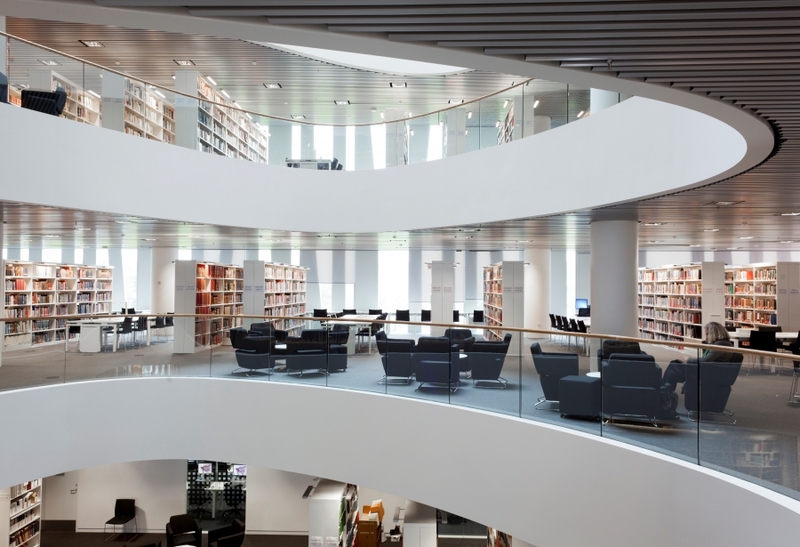 The Sir Duncan Rice Library has been designed with the needs of 21st century learners in mind, with lots of different sorts of space for the activities that visitors told us they needed most. Essentially the design of the building locates more social areas close to the atrium, so as a useful rule of thumb, the further you are from the hole in the middle, the more we encourage quiet. So where’s best for you? Our building is not a traditional, completely silent library. It’s built for collaborations and conversations to reflect more modern education needs, but also provides for traditionalists who like to hear themselves think in peace in old-school classic study style. 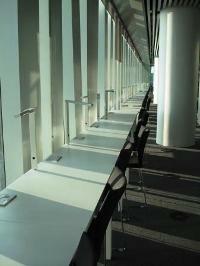 We have silent study rooms on floors 1, 3, 4, 5 and 6. There are two types of silent study space: one with spaces to plug in laptops and one without, so if your ideal space for revision is for no internet distractions or clicking of keyboards use these rooms. If you are in a silent study room with no plug sockets please do not use a laptop of tablet. 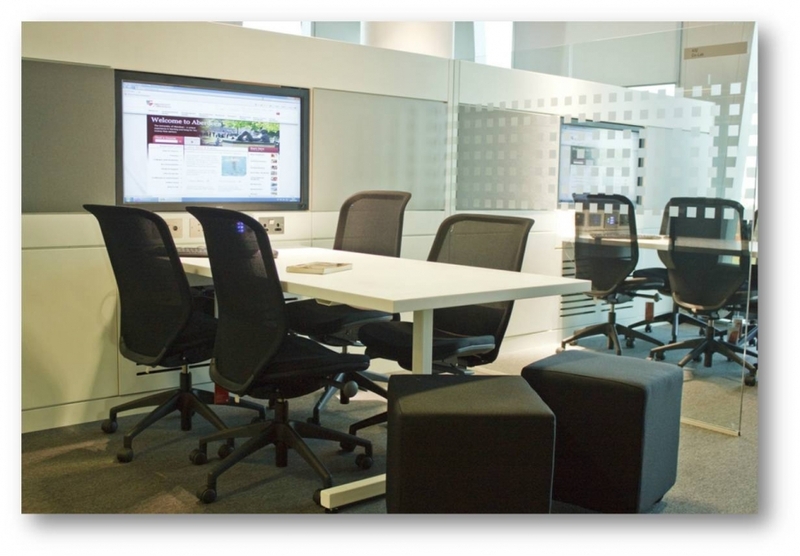 See our web page on silent study rooms for more information. Need collaboration for inspiration? Then our co-labs could be the place for you. These are specifically designed for group and project work, such as presentations, with spaces for 4-7 people; useful for group revision and idea-sharing. These are especially recommended if you are a more multimedia learner, as they offer built-in information technology facilities to allow you to use a range of digital devices. Co-labs include a PC, a plasma screen for viewing DVDs or online content, and multiple ports for headphones so you can listen and learn with others. These spaces are partitioned, so offer a little privacy, but please do be mindful of noise levels to respect other visitors. For those of you who like to plan ahead and study with company, there are two bookable Group Study Rooms on Floor 7. These rooms have space for up to 8 people, and have a PC and plasma screen. To book a Group Study Room for 1-2 hours, speak with staff at the Information Centre on Floor 1. Find full details in our Group Study Room Library Guide. Comfortable soft seating is available on Floors 1 to 5. These areas are ideal for individual reading, personal laptop use, reading newspapers on Floor 1, and for short and quiet conversation. Round Study Tables are near the lift/lobby area on Floors 3 to 6, and are intended for quiet conversation or collaborative work in pairs or small groups. The study desks by the windows around each side of the building and on the open floor areas on Floors 1 to 7 are intended for quiet, individual study, perfect if you want to enjoy your own little study-bubble, with or without your headphones, and look out at the Silver City in stunning eagle-view panorama. From all staff at the Library Service, we wish you the best of success with your studies and exams! This entry was posted in exams, general, services, students, taught postgraduates, The Sir Duncan Rice Library by ewanag. Bookmark the permalink.